E.V.E’s Creative Team: official bloggers, performers, creatives, and officials. All E.V.E fashion & art items are original designs protected under copyright laws in accordance with International Copyright Law and Second Life’s Terms of Service. Your purchase and use of E.V.E fashion & art items serves as your acceptance of these terms of service and policy. All E.V.E fashion & art goods are sold exclusively for use in the Second Life® virtual world at store/event locations and via E.V.E in the Second Life Marketplace. E.V.E reserve the right to discontinue/update, and adjust the pricing of any/all goods at any time and without warning. E.V.E fashion & art items are no transfer unless otherwise stated. Purchases are considered final and no refunds are issued. Delivery failure/error (non-copy items) – when you play Gacha Machines or purchase non-copy items while SL is doing maintenance you may experiment an Inventory Lost issue. Items appears as delivered in Local Chat and transcription history but are not showing in inventory. Clean caches and relog again and if the transfer items still missing contact Linden Labs and fill a ticked detailing the situation including your local chat information. Check SL Grid Status before purchasing. Display errors – Factors that may cause items failure to display properly may include/and are not limited to: server lag, user connection, third-party viewer faults. E.V.E Studio accepts no responsibility for such display errors – particularly those that occur within third-party viewers. NOTE: Only the goods named in transaction history may be replaced. Known Marketplace issues include delayed deliveries or failure. These issues are beyond the control of E.V.E Studio and remain the responsibility of Linden Lab ™. While every step will be taken to remedy these issues, E.V.E is limited in the actions it can take to help. When shopping via the Marketplace, you do so at your own risk and should contact Linden Lab ™ as your first priority in the event of failure. Pending Marketplace deliveries will reflect a deduction from your account balance. This amount is not transfered to E.V.E until such time as the Marketplace deems your item delivered and your transaction is completed by Linden Lab ™. This can take up to 24 hours. If you receive confirmation from the Marketplace that your delivery has been completed If you do not receive an Item bought please visit the Main Store to use the Re-delivery Terminal to get your replacement – you will receive an email from the Marketplace that you have been refunded the full purchase amount. E.V.E Studio does not provide refunds for failed Marketplace transactions – this is the responsibility of Linden Lab ™ as the service provider. More information on shopping through the Marketplace can be found online here. Mesh styles are labelled on promotional vendors and images within the store. TO DISPLAY MESH ITEMS A MESH-ENABLED VIEWER IS REQUIRED. More information on mesh-enabled viewers can be found here. 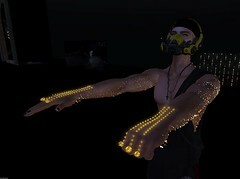 Rigged Mesh styles are designed to fit most standard SL avatar shapes, to move with the body of the avatar. Rigged Mesh styles can not be modified. This is a limitation of the technology. E.V.E Studio accepts no responsibility for the failure of mesh-styles to display properly, or at all because of the use of an outdated or third-party viewer that does not adequately support the use and rendering of mesh content. IT IS RECOMMENDED THAT CUSTOMERS USE THE DEMO VERSIONS OF RIGGED MESH BEFORE PURCHASE. E.V.E’s team Members will issue official communication from E.V.E Studio regarding promotional information, news, updates on the store, goods, or any other services associated with the E.V.E brand in the Second Life® virtual world. No other avatar/username has the authority to represent E.V.E in any capacity. Any false representation, theft, or fraud will not be tolerated. Any avatar displaying these names, but with account name information that does not match, is not one of those identified above. Before engaging with E.V.E Studio, ensure that you are interacting with the real deal! Membership of the E.V.E Group and Subscriber in the Second Life® virtual world is voluntary and free. – from time to time you will receive promotional messages including news and product updates regarding E.V.E goods, services and events. – you may receive inventory offers of items such as free group gifts and are under no obligation to accept or keep them. E.V.E OWNER, STAFF OR REPRESENTATIVES DO NOT UNDER ANY CIRCUMSTANCES SUBSCRIBE ANY AVATAR OR USERNAME TO THIS SERVICE, WITHOUT THEIR CONSENT. Blogger requests are currently being solicited. Under regular circumstances, these are assessed based on criteria determined by E.V.E staff representatives and acceptance of requests made at their discretion. If you see stolen content, please report it to the creators. Your assistance in this matter is very much appreciated. Second Life® and Linden Lab are trademarks of Linden Research, Inc. This blog is not affiliated with the aforementioned parties, nor affiliated or sponsored by Linden Research.